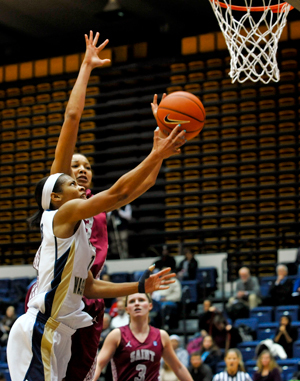 GW ended a its five-game losing streak Sunday by reversing a pattern, turning its season-long struggles on offense into an efficient and methodical attack. The Colonials (7-10, 1-2) defeated Atlantic 10 newcomer VCU 79-68, committing to attacking the heart of VCU’s 2-3 zone defense. GW attempted only nine treys over the course of the game and they converted just one, but the Colonials shot an efficient 53 percent from the field overall. The balanced offensive attack produced five double figure scorers and forced the Rams into attempting 20 three-point shots in an effort to keep up with the Colonials’ offense. Chekecia Miller goes for a basket at a game earlier this season. VCU could not key in on any particular GW player, because many were scoring proficiently. Sophomore guard Chakecia Miller led GW with 20 points, converting six of seven shots and making all eight of her free throw attempts. It was Miller’s second straight game of scoring 20 or more points. Graduate student Tara Booker supplemented Miller’s scoring efforts with 19 points, and graduate student Sara Mostafa posted a double-double, chipping in thirteen points and ten rebounds. GW showed off the complete potential of its offense as the first half came to a close. The Colonials, down by four, were determined to avoid a sixth straight defeat. They closed the half on a 10-0 run to take a 42-36 lead into the break. The team backed up its shooting with a strong showing at the charity stripe, going 20-for-21 from the free throw line. Further supporting GW’s attack was a dominant defensive showing that gave the team a 43-30 advantage on the boards and held the Rams to 33.8 percent shooting on the game. The victory against VCU was the first A-10 win of the season for the Colonials and Tsipis’ first as a head coach. While Tsipis and his squad are glad to have snapped their five-game losing streak, they are more encouraged by the overall quality of play that led to the win on Sunday. Consistency will be key as the Colonials prepare for conference play. Tsipis is encouraged by his team’s victory against VCU – especially that the win came on the road. Four of the five games during GW’s five game losing streak were on the road and every victory away from the Smith Center will require maximum effort and focus. GW will play another conference road game Thursday when they take on Dayton. Tsipis acknowledges that the Flyers are a tough opponent and will be a real test for his team, but he trusts his players.